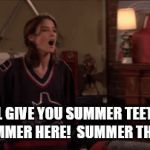 I'LL GIVE YOU SUMMER TEETH! SUMMER HERE! SUMMER THERE!